Munzee is a real world scavenger hunt game where items are found in the real world and captured using your smartphone. You then level up and gain rank based on your score. Points are obtained by capturing other people's munzees or when your deployed munzees are captured by someone else. Munzee is based off of the fundamentals of geocaching and adds another layer of fun to the hunt. Badges can be earned by unlocking specific achievements. What do munzees look like? Munzees come in any size or shape but all must contain a QR code style bar code. The bar code combined with your GPS coordinates are the essential gameplay elements of munzee. Munzees can be hidden in containers, camouflaged or even in plain view. For more information, visit Munzee.com. According to Opencaching.us, Geocaching is an outdoor sport or activity in which cachers use a GPS to find a "treasure" hidden by other participants. Caches are secured in watertight containers, containing trinkets and/or a logbook in which they record their discovery of the cache. The coordinates of the location of the caches are stored in online databases along with descriptions and instructions necessary to find them. Arm yourself with the portable GPS unit of your choice (see below for ideas), then visit Geocaching.com and create a free account. Read the "Getting Started" info as it provides a lot of helpful information. Now you can select "Hide A Cache" or "Seek A Cache" from the menu and search for caches in your area. We suggest searching by zip code or state. Follow the instructions for your make and model of GPS and download the waypoints into your GPS. Grab a pen, paper and a camera and you are ready to begin your hunt. Virtual Caching is a hunt for unique and interesting places or locations. We visit many different places as we travel and we like to share them online. Opencaching.us provides the tools you need to add and keep track of all the sites you have been to. All you need to get started is a free account at the Opencaching site, the ability to travel and preferably a GPS unit. Not all virtual caches require a GPS to find, so if you don't have one yet, that's fine. There are many places you can find without one and you can even list new ones on the Opencaching web site. Virtual Caching is easier than geocaching since you don't have to hunt for small containers. Since we mainly use the Jeep once we are set up at our camp site, we use it to get to most of the spots we have visited. If we happen to be in your area and you know of a spot you'd like us to visit, send us an email and let us know. 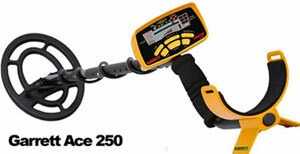 We have a Garrett Ace 300 metal detector and a Garrett Pinpointer that we love to use. Whenever we get to a new location, we scout out for places to go treasure hunting. Local parks, playgrounds, open fields, farms, beaches... any place we can get permission to search. We have found all sorts of things like new and old coins, jewelry, belt buckles, hand tools, bullets and lots of trash. The item we find the most of is the pull tabs from soda cans. We sure wish people wouldn't litter! We don't think we'll ever hit the mother lode but it sure is a whole lot of fun trying! 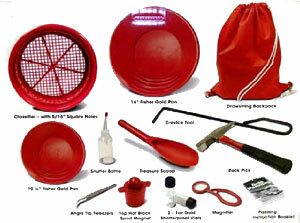 We have a Fisher Hardrock Pro Gold Panning Kit and that gives us everything we need to have a little fun in creek beds. I wouldn't really say we have gold fever, but you might say we have gold "flu like symptoms". It's very exciting to find a piece of gold, regardless of the size. If one day we suddenly upgrade to a brand new truck and camper, then you can safely assume we either won the lottery or found one heck of a gold nugget.